Please help me with my Honey Candy recipe! I have a disease where I can have no starch and no dairy! I love chocolate and I make this chocolate honey candy. It is made with unsweetened Baker's chocolate, honey, vanilla, and olive oil. It seems to be ok but its waaay too chewy! Is there any way to make it with those ingredients to where it has more of a chocolate bar consistency since I can't eat bought bars?? Okay, let's talk about Homemade Honey Candy Recipes! When Shauna first submitted this question a few years ago, I really didn't know what she could do to correct her recipe in order to make it more like the consistency of a chocolate bar. I posted the question in hopes that someone else could give her some advice, but as time passed, no one responded. I came across the question again today as I was doing some maintenance on the site and realized that I've learned a few little tips since then and can offer some suggestions for those of you who want to make a healthier candy option using chocolate and honey. First of all, I LOVE HONEY. My dad has been a beekeeper for decades and I've helped him extract honey from the hives on more than one occasion. Mmmm! That golden treasure is so delish and full of goodness. Although honey is a sugar, it's a naturally good sugar and has a lot of other beneficial properties. Of course, moderation is still important, but you should really be able to enjoy candy made with honey with little or no guilt. sure if you're still watching this post Shauna, but I'm wondering if you heated the mixture. That's the only reason why I think you'd have a chewy candy result. Okay, it's probably more like a "fudge" in some ways, but you're not going to get an actual candy bar texture if it's not manufactured the way regular chocolate is made. Some people heat the mixture slightly to get a good mix, but you really don't need to heat it at all (unless it is really cold in your house). Just blend it all up and pour it into a dish to set. If you want bite-sized pieces, you can use candy molds or an ice cube tray. Pop it in the freezer (the fridge works, too) until they set firmly. You'll want to keep them refrigerated (or frozen) until they are ready to be eaten. HINT: You can add 1/2 cup or so of peanut butter (or other nut butter) for another flavor option. The amounts of each ingredient is pretty flexible to your own taste and likes. This is a very forgiving recipe and is fairly healthy, too. 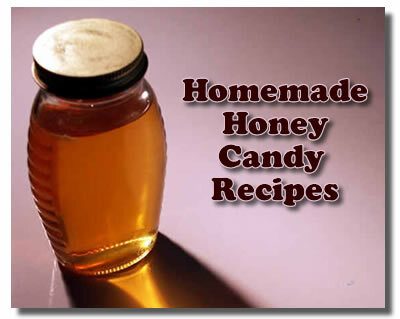 Does anyone else have a homemade honey candy recipe to add? Share it below!